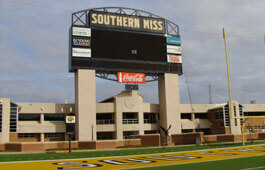 Tickets to the 2013 edition of DCI Southern Mississippi in Hattiesburg, are now on sale through the DCI Box Office: DCI Southern Mississippi Hattiesburg, MS Date: Wednesday, July 24, 2013 Venue: M.M. Roberts Stadium at the University of Southern Mississippi Tickets: Starting at $25, discounted group rate also available Featuring: Blue Devils, Blue Stars, Colts, Mandarins, Phantom Regiment, Pioneer, Spirit of Atlanta, Troopers Learn more about this event and purchase tickets. On February 11, an F-4 tornado tore through Hattiesburg causing damage to the Southern Miss campus and surrounding areas. In the following video, learn how students banded together in the wake of the natural disaster to clean up the community. Contribute to the Southern Miss Emergency Relief Fund.